and a talented young writer with a potential Broadway hit. 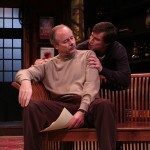 Porter Milgrim – JOHN J. STEELE, JR.
ANDREW BOTSFORD (Sidney Bruhl) is a veteran of more than 30 Hampton Theatre Company productions since 1985. He appeared most recently as Marc in ‘ART’. In addition to ‘ART’, favorite shows include ONE FLEW OVER THE CUCKOO’S NEST, GLENGARRY GLEN ROSS, EVERYTHING IN THE GARDEN, THE FOREIGNER, ORPHANS, NOISES OFF, THE DINING ROOM, SYLVIA, SOCIAL SECURITY and RUMORS. The host of “Tuesday Night at the Movies with Andrew and Friends” at the Westhampton Beach Performing Arts Center during the summer, Andrew, a resident of Quogue, currently teaches and does communications work at the newly expanded Graduate Arts Campus at Stony Brook Southampton. ROSEMARY CLINE (Myra Bruhl) played Mrs. Lotty Wilkins in last spring’s production of THE ENCHANTED APRIL, Candy Starr in ONE FLEW OVER THE CUCKOO’S NEST, Charlotte Hay in MOON OVER BUFFALO and many other roles dating back to the beginnings of the HTC. After several years in NYC with various successes on the stage and small screen, it is good to be home again where I began. Thanks to Ed, Jean, our delightful backstage crew and my fellow cast members. My love to Christopher, Cashew and Carter… with a wink to Mom and Dad. DIANA MARBURY (Helga Ten Dorp, Producer, Set Decor) is pleased to tread the boards with such a talented cast. Diana directed ‘ART’ last winter, and was seen most recently as Mme. Parole in MY THREE ANGELS, Mrs. Fisher in THE ENCHANTED APRIL, as Lillian Troy in I HATE HAMLET and as Nat in RABBIT HOLE. She is the Artistic Director of the HTC and has worn many hats over the years. She would like to thank all the “behind the scenes” people who make these productions possible. She would particularly like to thank her son Sean for bringing his gifts to the company table. JOHN J. STEELE, JR. (Porter Milgrim). 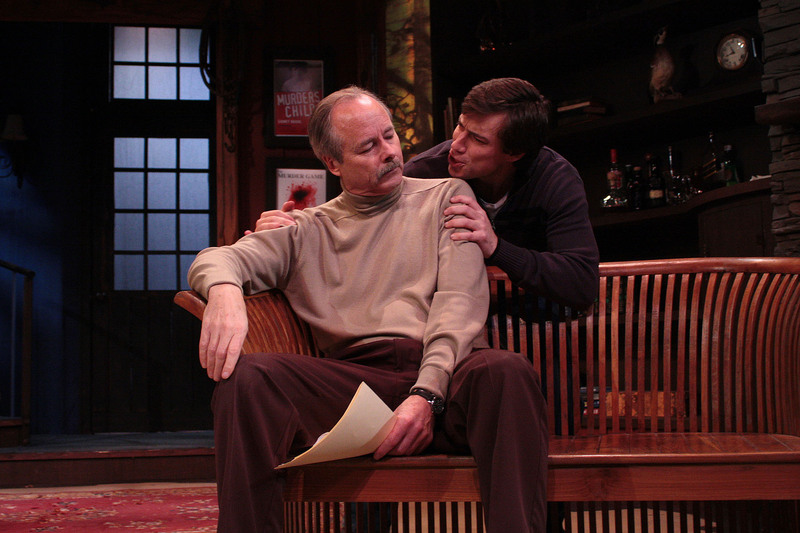 DEATHTRAP marks John’s debut with the Hampton Theatre Company. Favorite past roles include Arthur in CAMELOT, John Merrick in ELEPHANTMAN, seven men, two women and a dog in GREATER TUNA, and Danny in XANADU. John is also an award-winning director. He would like to thank everyone at HTC for this opportunity and all of you who fill the seats and support live theater here on Long Island. TRISTAN VAUGHAN (Clifford Anderson) made his HTC debut last spring as Thomas Briggs in THE ENCHANTED APRIL. Tristan has relocated to New York from Los Angeles, where he recently starred in the short films Yield and Deadline. Favorite stage roles are Leantio in WOMEN BEWARE WOMEN, (where he met his beautiful wife), Victor in Bernie Weinraub’s ABOVE THE FOLD at The Road Theatre Company in LA, and Jed Brown in CHICKAMAUGA by Kieth Szarabajka at Ensemble Studio Theatre Los Angeles. Training: George Washington University’s Academy for Classical Acting (MFA); Circle in the Square; RADA. He wishes to thank God, his family, and the wonderful cast and crew of DEATHTRAP! IRA LEVIN (Playwright) was both a playwright and a novelist, with a number of his works having been adapted for film. 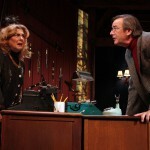 Among his plays, which include NO TIME FOR SERGEANTS, CRITIC’S CHOICE and VERONICA’S ROOM, DEATHTRAP is the best known and holds the record for the longest-running comedy-thriller in Broadway history. His best known novel is Rosemary’s Baby, others including A Kiss Before Dying, This Perfect Day, The Stepford Wives and The Boys From Brazil. EDWARD A. BRENNAN (Director) made his Hampton Theatre Company directing debut last spring with I HATE HAMLET. He has appeared onstage with HTC as Arbuthnot/Arundel in THE ENCHANTED APRIL, Chief Bromden in ONE FLEW OVER THE CUCKOO’S NEST and as Ralph in FROZEN. His favorite professional acting credits include the title roles in PHANTOM and JEKYLL & HYDE, Owen in VOICES IN THE DARK, Ross in VISITING MR. GREEN, Beast in BEAUTY AND THE BEAST, Albin (ZaZa) in LA CAGE AUX FOLLES, Jamie in THE LAST FIVE YEARS, and Archibald in THE SECRET GARDEN. 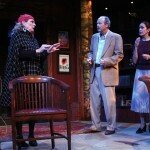 Ed holds a Masters degree in Theater and has directed over 30 productions on Long Island. SEAN MARBURY (Set Design) has worked for many years building HTC sets alongside his father Peter and friend James Ewing. He is thrilled to don the esteemed mantle of set designer as well as chief carpenter for the first time with this production. 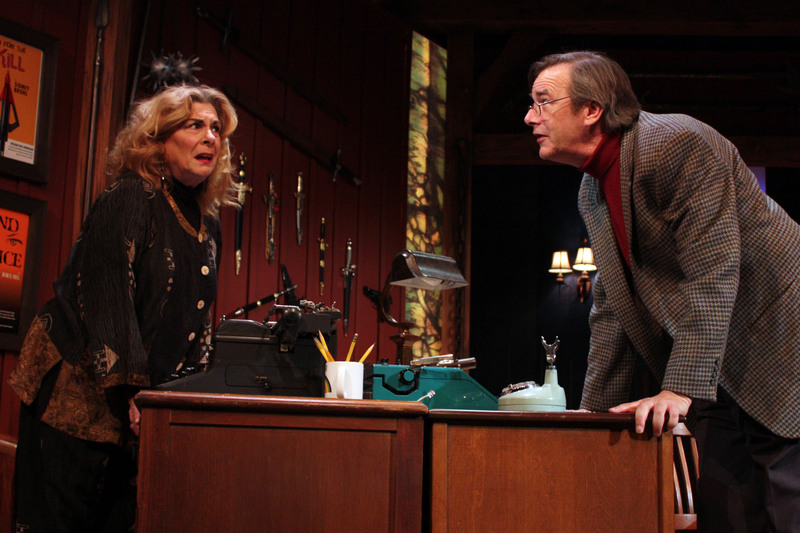 As with any thriller worth its salt, “Deathtrap,” now playing in Quogue through Sunday, January 29, has more twists and turns than a corkscrew. 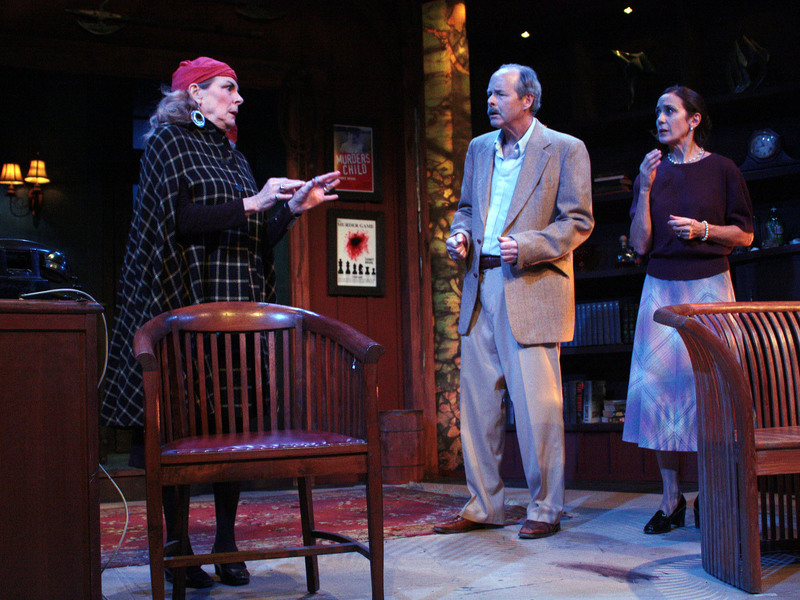 The play, by Ira Levin and staged by the Hampton Theatre Company–which stars Andrew Botsford as frustrated mystery playwright Sidney Bruhl; Rosemary Cline as his excitable wife, Myra Bruhl; and Tristan Vaughan as Clifford Anderson, a fledging playwright and acolyte of the once-great mystery writer–is cleverly written and playfully acted. 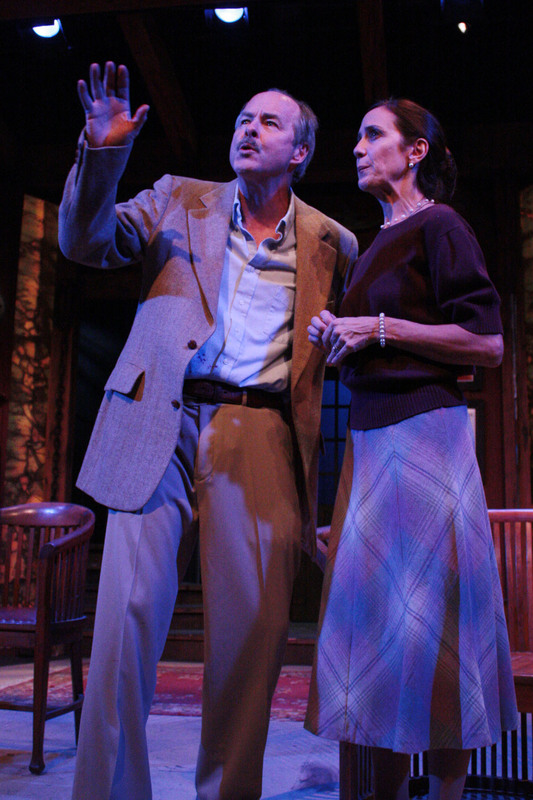 This one-set, five-character, two-act play also features the scene-stealing Diana Marbury, who plays Dutch psychic Helga Ten Dorp; and HTC newcomer John J. Steele, Jr. as Porter Milgrim, a very dull, yet quite sharp, lawyer. 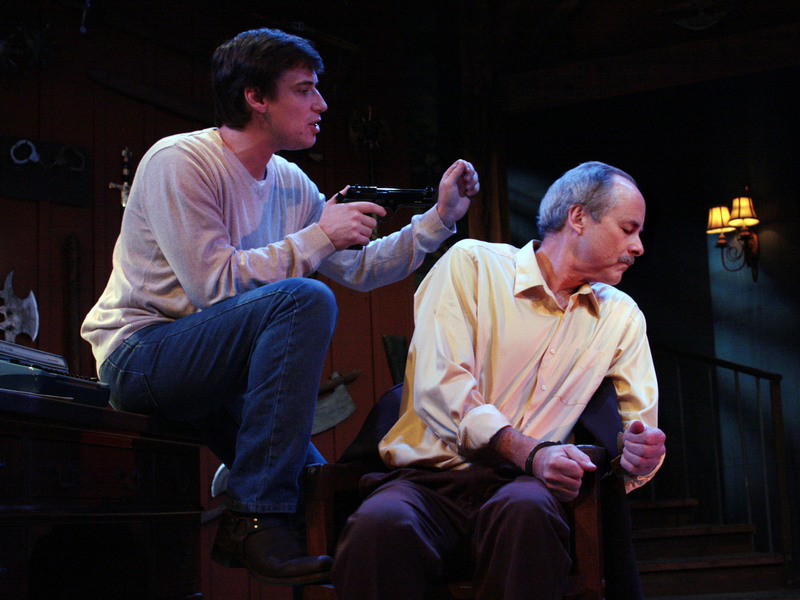 Hampton Theatre Company has chosen well with this play, which holds the record for the longest running comedy-thriller on Broadway. 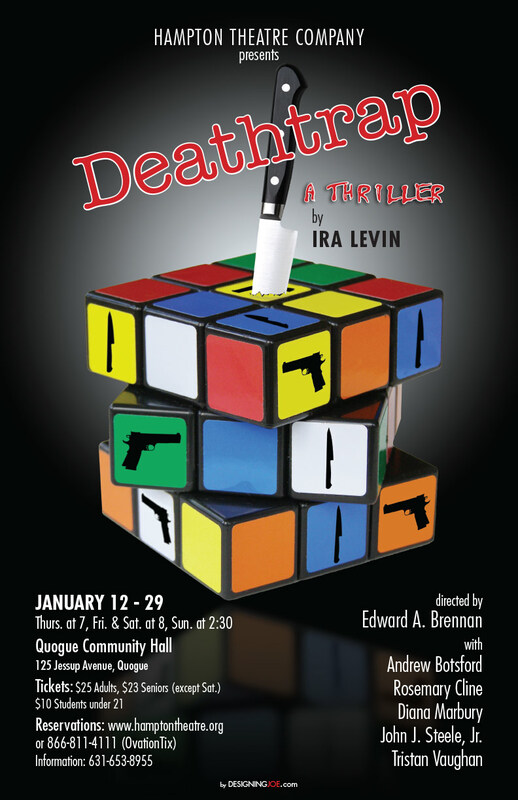 The quickly moving plot is engaging and compelling and the actors in this production were chosen quite perfectly for their roles by “Deathtrap” director Edward A. Brennan and producers Sarah Hunnewell and Ms. Marbury. Not wanting to spoil the fun for those who aren’t familiar with the play, this reviewer will set the stage and then quickly move along to other “Deathtrap” business. The setup begins with Sidney and Myra at their Westport, Connecticut home. 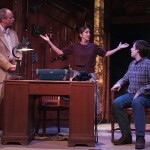 Sidney, whose last big success “The Murder Game” was nearly 20 years ago, is now struggling with writer’s block and is unhappily teaching classes for beginning playwrights. The murder master’s dry spell is about to come to an end when he discovers that one of his students, Clifford, has written a play that is destined to be a sure-fire hit. 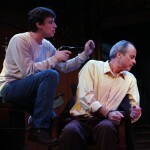 Sidney then decides to murder his student and claim the play as his own. 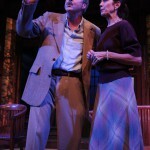 “You wouldn’t actually kill someone for a successful play would you?” Myra asks her husband in the first scene. “Don’t be silly dear, of course I would,” he drily replies. And so the thrills begin, and don’t stop coming until the final moment of the play. As always, the sets on the HTC stage are sublime. From a handsome “murder wall” full of malevolent instruments of death to a quite realistic fireplace, this stage looks luxuriously appointed and move-in ready. The production values were also top-notch, again, as to be expected from HTC. Bottom line: This thrilling yarn unravels in a most entertaining fashion. 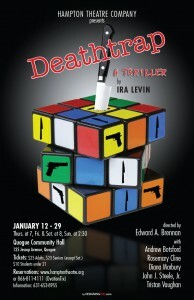 Aside from distinguishing itself as the longest-running comedy-thriller in Broadway history, Ira Levin’s “Deathtrap” may be one the cleverest plays within a play ever. Director Edward A. Brennan brings a keen sense of humor and timing to the Hampton Theatre Company reprise of the Tony-nominated 1978 classic (remade into a 1982 hit movie). 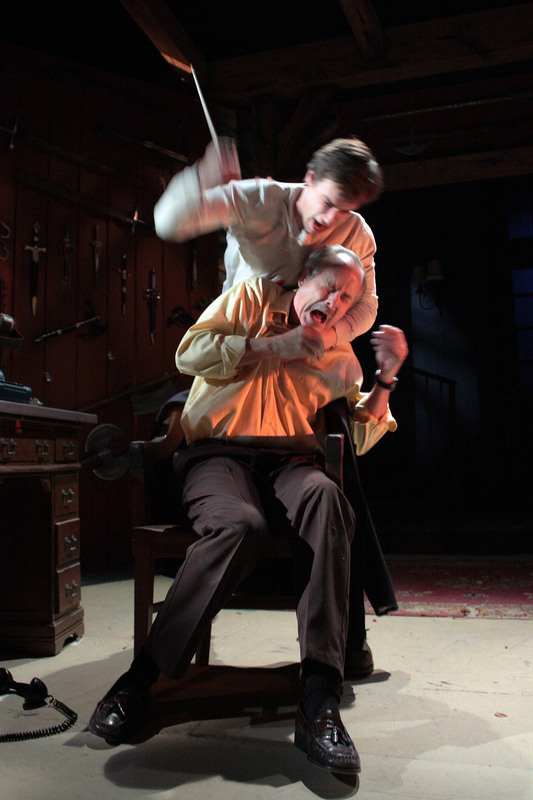 The play within — also titled “Deathtrap” — exists only on paper and in the competitive minds of the author and his mentor. We hear only bits and pieces of it read aloud and enacted in a fight scene. Sidney Bruhl is a formerly successful author of stage thrillers with whom a onetime student, Clifford, has entrusted his manuscript. As Sidney observes, it’s “a thriller in two acts, one set, five characters and laughs in all the right places.” Levin is describing the very play we’re seeing unfold in startling twists. It would be criminal to reveal much beyond the basic premise. So we’ll just say that Sidney invites Clifford to drop by his country home to discuss the young man’s promising play. 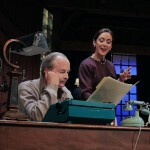 Clifford discloses that he’s brought the only carbon of the play with him — this is still the typewriter era. The admission unnerves Sidney’s wife, Myra, who fears her husband may be capable of crimes he creates on paper. As Clifford, Tristan Vaughan keeps us guessing with the gullible air of an admirer and the caution of a near-stranger. Rosemary Cline as Myra works both angles, protecting Clifford by refusing to leave the room while pumping him for information that might cut Sidney in on a slice of the “Deathtrap” pie. 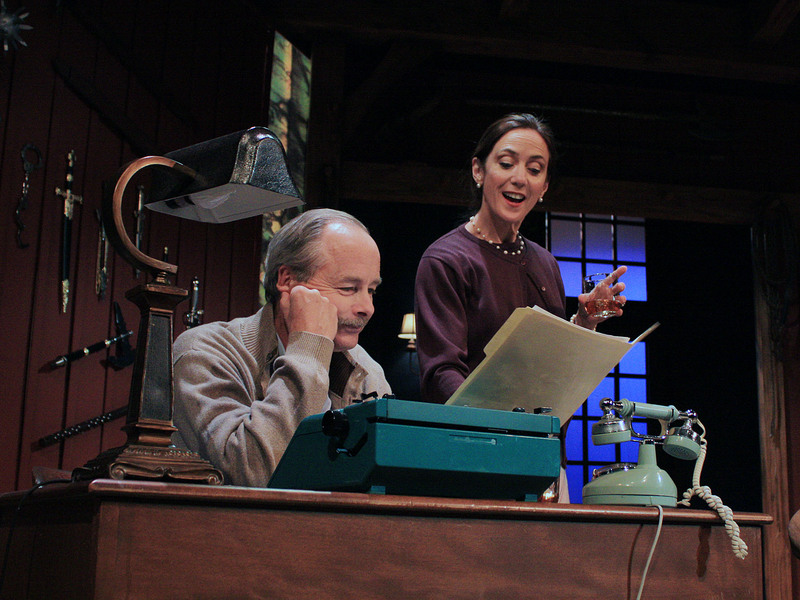 The set designer’s mother, Diana Marbury, plays a psychic neighbor brimming with eccentricity and accented worldliness, while John Steele Jr. as Sidney’s attorney supplies a dose of dullness and a necessary touchstone to sanity. 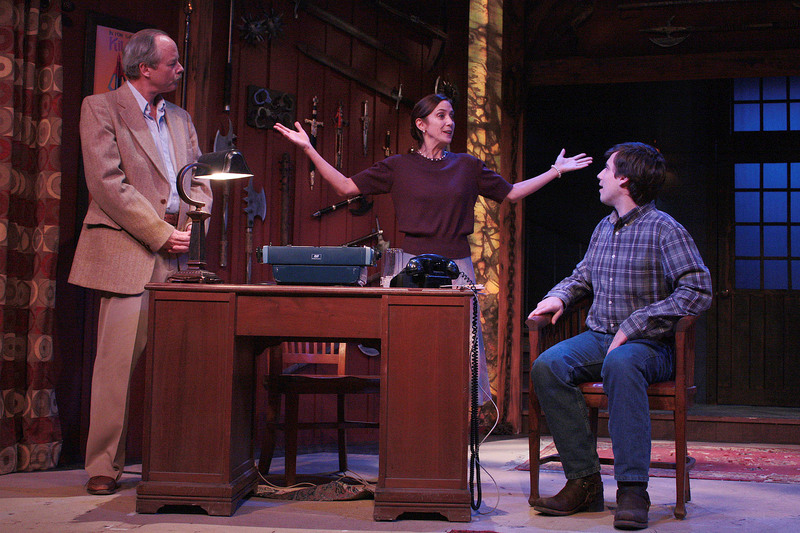 The play is Sean Marbury’s debut as set designer/chief carpenter, which was his father, Peter’s realm before his death in 2009.